The new Submission Tool allows you to submit documents electronically directly to the UC Davis Financial Aid Office. 1. You will need to register with your student information before requesting an appeal. Once you are logged on, you may request an appeal by selecting the "+ - Request" button. 2. 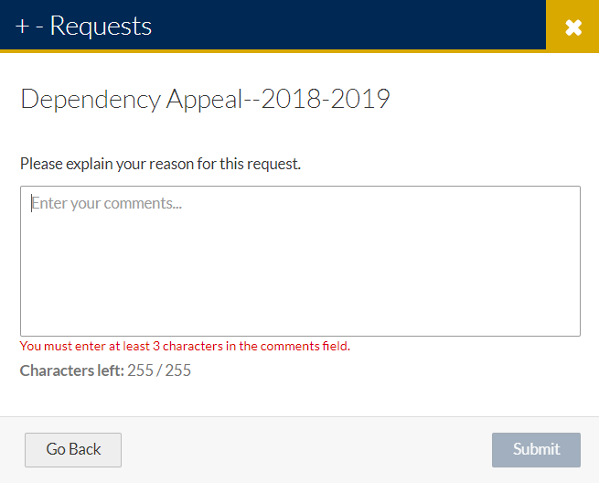 When requesting the Independent Appeal, you will need to enter an explanation for the request. This is not your appeal statement, so please keep your explanation brief. 3. Once you have submitted the request, you will see the documents needed before completing the appeal submission process. Please note, the Third Party Documentation you will be required to upload refers to any supporting document for your appeal (i.e. taxes, bills, additional statements, etc.). If the Financial Aid and Scholarships Office requests additional documentation; it will also be labeled as "Third Party Documentation". 4. Once all appeal documents are uploaded, click the "Submit" button, then the "Finish" button. If you have additional documents that need to be added to your appeal after it has been submitted, you will need to submit them via Contact an Expert. 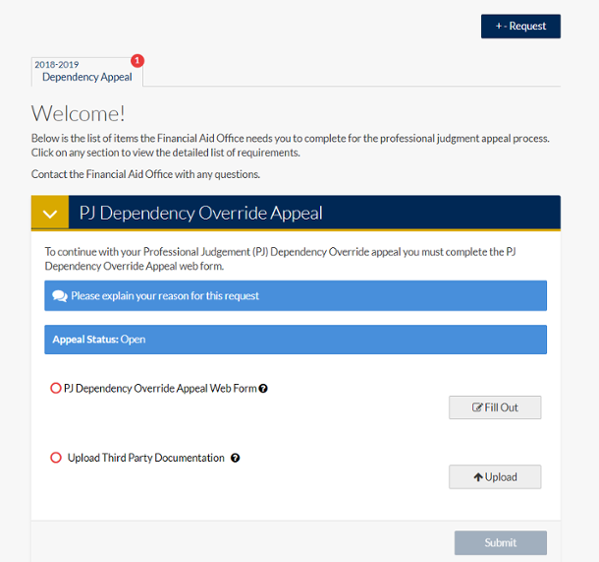 To request a Dependency Override Appeal, continue to the Submission Tool.